Five years ago, I wrote a column about how the fax machine refuses to die. Five years is a long time in terms of technology, but only a short time in terms of fax machines. Depending on how you define the point of origin of the first method of distributing images or photographs over an electrical wire, the fax machine may date back to 1843. There was a telefax service in operation between Paris and Lyon, France, in 1865. Transmission of images over wireless radio networks was routinely conducted throughout the early 20th century. The modern facsimile machine as we know it was introduced in the United States in 1964. Of all of the computing or digital technologies commercially available in 1964, you probably won’t find any of them in a Staples today -- except the fax machine. We don’t use dot-matrix printers anymore or CRT monitors or televisions. We’ve largely migrated from landlines to cellphones, and even our landlines are digital in most places these days. The technologies from that era are all museum pieces now, with the glaring exception of this ancient document transmission system that continues on like a zombie, devouring forests of paper and screaming 14,400bps modem tones. This was brought back into stark contrast to me the other day when I was forced to spend hours on the phone with several health care companies to clear up a problem related to a garbled fax transmission of a prescription renewal. It’s 2016. I can stream live television from one side of the Earth to the other in HD. I can use my watch to make phone calls, display a boarding pass on a plane, and start my car from anywhere. I have no fewer than a dozen different means to communicate with friends, family, and co-workers located virtually anywhere on the planet -- or even in orbit. Yet we’re still highly dependent on the ancient ritual of taking rough scans of paper, making an analog telephone call, connecting with a remote modem at speeds that might fall to 9,600bps or lower, and transmitting an image of that paper, one line at a time, to a printer on the other side. It’s madness. We’ve managed to eradicate cigarettes from every workplace in the U.S. between 1964 and today, but we’re still heavily addicted to our fax machines. There are a few reasons for this. The first is the law of lowest common denominator. 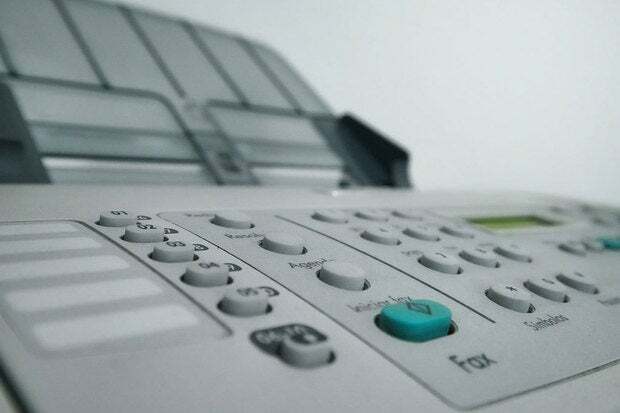 Fax machines are so ubiquitous that if you need to send a document to someone at another company, they’ll undoubtedly have a fax machine if all else fails. Second, people still believe that they need to physically sign documents that have been sent to them digitally, then redigitize them. This is what leads to people printing out 12 pages of a PDF, signing the last page, then faxing the whole thing somewhere. The one thing that fax machines have in their favor is that they provide direct communication. If a document is faxed from one place to another, it can be accompanied by an immediate receipt stating that it was received. Further, the progress of the transmission can be directly monitored. Lastly, the security of the transmission itself has at least the appearance of being solid, because it’s a direct connection. This is the main reason why health care providers maintain the use of fax machines to transmit sensitive information. Of course, it would be far better for all involved if, rather than printing out Word documents and faxing them, we sent them by email. Why don’t we? Why do so many businesses continue to rely on fax instead? After all, email should be more secure, more reliable, and vastly better than fax machines for transmission of even the most sensitive information. At least, there’s no technical reason that it’s not. We can provide end-to-end encryption for email transmission and reception, we can provide return receipts, and though it’s generally been frowned upon, we can even send large attachments via email. The sad fact is that email never became the secure way to transmit sensitive materials that it should be. That’s on us -- after all this time, we never got email right. The current state of email is akin to a potholed tarmac, glistening in some places, worn down to the gravel in others, and littered with flyers and pamphlets hawking all kinds of crap. When you send an email, you must trust that the server on the other side is properly configured and secure. You must also hope that its spam filters are tuned properly, or that you’re an approved sender in its whitelist. You have to hope that if the recipient is having service issues, there are adequate secondary servers in place. If they’re using a large email provider, you’d better hope that you aren’t on an errant blacklist that causes your message to be silently discarded. And good luck to you if someone else has used your ISP or mail relay as a spam or malware vector in the past, and your relay has been blacklisted as a result. That’s the reality of email today, and it’s an ugly, scabrous place. Given that perspective, it’s not hard to understand why some companies continue to rely on fax machines. From their point of view, reliable and “secure” document transmission technology remains in the 1960s. If we’re ever to rid ourselves of the fax, we either have to fix email, or we have to develop standards that are not subject to the vagaries that have corrupted email, but can be used by any provider to communicate within and without their own network. One way or another, we need to re-create the fax system for the modern world, because the fax system of 1964 is far beyond obsolete -- it's shameful.